Bibliometrics is the quantitative analysis of scholarly publications, such as books and articles. Citation analysis is a commonly used bibliometric method. It measures the research impact or influence of an individual researcher, or research group. It should be noted that citation patterns vary from discipline to discipline and therefore metrics may not be the only measure to be used to assess impact. Locate the article then select the Times cited or Cited by link. Please note the citation rate may vary in each tool due variations in coverage. No citation tool will provide a complete citation count. Variations occur because citation tools have different source materials, date ranges and sometimes erroneous records. See below an example of distribution of citations of a book in Bar-Ilan, J. 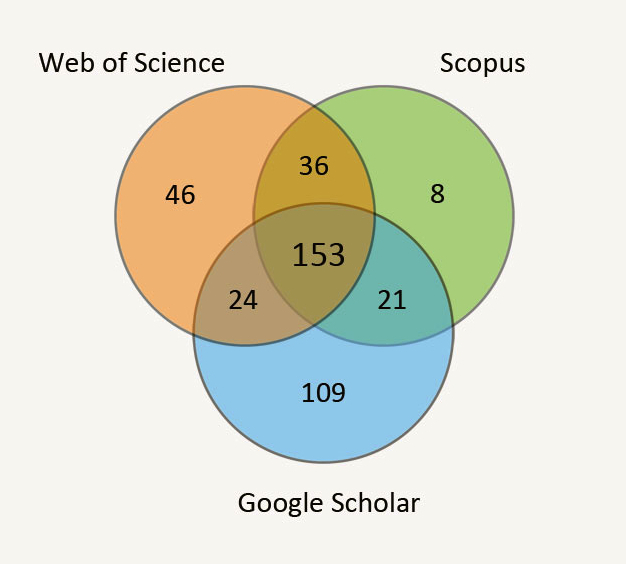 (2010) Citations to the “Introduction to informetrics” indexed by WOS, Scopus and Google Scholar. Scientometrics, 82(3), p.504. Note also that citation counts are not comparable across disciplines. For example, citation counts in Social Sciences and Humanities are lower because researchers are more often publishing in books and conference papers that are not well covered by citation databases. Journal Impact Factor (JIF) is used to measure and compare the influence of journals and are published in the Journal Citation Reports database. We no longer have access to this database but you can obtain the JIF for a particular journal from its web site. SCImago Journal Ranking (SJR) is is a journal metric based on the Scopus database which measures the scientific influence of scholarly journals that accounts for both the number of citations received by a journal, and the importance or prestige of the journals where such citations appear. Publish strategically! The following tools will help you discover the ranking of journals in different fields. They will help researchers - Higher Degree Research Students and Early Career Researchers in particular - discover which journals to publish in. Journal Citation Reports - we no longer have access to this tool for finding the Journal Impact Factor (JIF) - please see the individual journal web site to obtain the JIF. Alternatively, you can carry out a journal search in Manuscript Matcher. Maximizing the impacts of your research: a handbook for social scientists This Handbook, by the London School of Economics Public Policy Group, is a guide to help researchers achieve a more professional and focused approach to their research. It provides a large menu of sound, evidence-based advice and guidance on how to ensure that your work achieves its maximum visibility and influence with both academic and external audiences.